Fragrance free baby wipes that gently cleanse your baby’s delicate skin. Dermatologically tested. 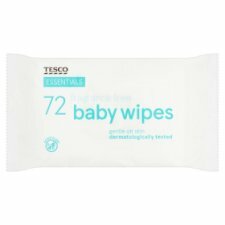 Tesco Essentials Baby Fragrance Free Wipes 72 pack. Fragrance free baby wipes that gently cleanse your baby’s delicate skin. Dermatologically tested. Pull the first wipe through the opening and you're ready to deal with anything and everything. Always reseal the label after use to keep the remaining wipes moist. Do not flush down the toilet, dispose of with normal household waste. INGREDIENTS: Aqua, Phenoxyethanol, Sodium Benzoate, Propylene Glycol, Sodium Citrate, Benzoic Acid, Dehydroacetic Acid, Tetrasodium Glutamate Diacetate, Sodium Hydroxide, Citric Acid, Aloe Barbadensis Leaf Juice.